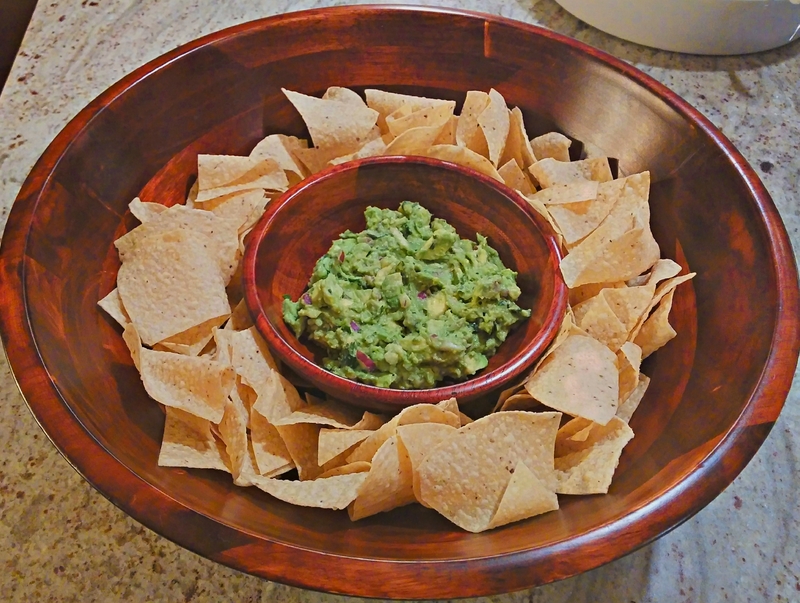 A traditional Mexican dip, guacamole has become a staple in the American diet as well. Avocados are high in fat, but they also have a number of nutritional strengths such as a high potassium and fiber content. There are two main components to making the perfect guacamole. Choosing good avocados, and properly seasoning. If you have the time, the very best way to buy avocados is to buy them when they are rock hard and green. You can then allow them to ripen undisturbed on your counter top until they have slightly softened and the outer skin has turned from green to black. Once the avocados have reached their desired ripeness, you can move them to the refrigerator to greatly slow the ripening process and preserve them for days at their ideal ripeness. To speed the ripening of an avocado, place it in a closed paper bag with with an apple or banana. The apple or banana omits ethylene, which triggers and speeds the ripening process. If you are shopping for avocados to use the same day, look for an avocado that yeilds slightly to a gentle squeeze. The avocado shouldn’t have any divets or feel mushy when squeezed, these are signs of an overripe fruit. To remove the flesh of the avocado from the avocado, slice the avocado lengthwise into halves. The pit will remain in one half of the avocado. Remove the pit by knocking your knife blade into the pit until it sticks, then twist the knife to extract the pit. From there, you can use a spoon to extract the flesh from the skin of the fruit. Guacamole should be made to your personal taste, and the more you make it, the more you will refine your personal recipe. The key ingredients are onion, lime, cilantro, garlic, chili pepper and salt. Salt is very important in guacamole. Avocado’s flavor is greatly enhanced with a generous sprinkle of salt, so don’t forget to season liberally. The two ingredients that warrant the most experimentation are garlic and chili pepper. I like a kick of garlic in my guac, but I don’t want the garlic to overpower the avocado flavor. One clove per every two avocados seems to be the right amount for me. If you like less garlic flavor, use less garlic, or roast the garlic to mellow it’s bite. You can even omit the garlic altogether if you prefer. Making guacamole is one of the rare times that I use my garlic press. While pressed garlic is prone to burning when sauteed, the paste-like yield of the garlic press is perfect for guacamole. It allows you to distribute the garlic very evenly throughout the dip. My preferred chili for guacamole is the serrano. To me, it has a fruitier quality than the jalepeno. However, a jalepeno will work fine as well. I typically remove the seeds and membrane from the chili to prevent the guacamole from being too spicy. If you like a spicier gauc, then feel free to leave them in and/ or use more of the chili. If you are adverse to spice, you can omit the chili. Sometimes I add a finely diced tomato to my guacamole. Particularly in the summer when tomatoes are in season and flavorful. Adding tomato also increases the bulk of the dip without adding extra calories and fat, so it’s a good addition if you are looking to lower your calorie and fat content per serving. My version of the classic Mexican dip. 2 medium sized ripe avacados, cut in half and flesh scooped from skin. Mash avacado with a fork to create a chunky texture. Add onion, garlic, jalepeno, lime juice, cliantro, salt and pepper and mix well to combine. Guacamole doesn't store particularly well, so I try to make only what I will use in one meal. If you do have leftovers, the best way to store leftover guacamole is to cover it with plastic wrap, allowing the plastic to touch the surface of the guacamole. Couldn’t be a more perfect authentic guac recipe if I had written it myself (spoken from a big avo producing region! lol)…. but did you know you can also put the pit from the avo back in the guac to help keep it fresh? Oh – that’s a great tip! I do that too and it helps a lot. When I only need half I use the non-pit half and keep the pit half covered in plastic wrap in the fridge.